If you could live for eight minutes without gravity, how would you spend them? Filmmaker Mike Mills couldn't resist pulling out his phone and capturing the experience, but only briefly. "One or two times we popped out our cell phones and took some pretty cool looking slow-mo stuff," said Mills, executive producer at Toronto-based production company Studio M. "And the slow-mo is interesting because that's where it starts to more mirror the experience your mind thinks it would be like." But then, regret crept in. "After we put away our cell phones, I sort of felt like I'd missed it," he said. "It's sort of a cautionary tale of the modern age in general—that we're all too busy documenting our lives to live them." I can relate. I'm clearly no astronaut, and definitely not of the interstellar caliber that NASA needs to steer anything more complex than a Chevy Cobalt. 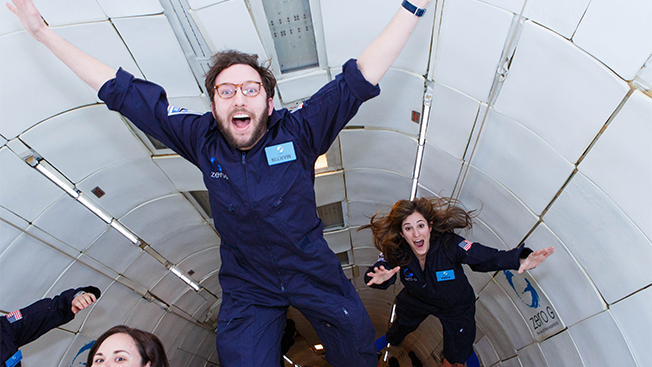 So, why in the world am I talking about what it's like to experience reduced gravity? Last weekend, I got a last-minute chance to join programmatic video advertising platform Virool for the final stage of a contest it began in 2014 to send one lucky creative to space. Adweek had already written a few stories about Virool's contest, which called for creatives from around the world to submit a commercial for a chance to win a flight on a future Virgin Galactic flight. The winning brand was Quaker Canada, which, along with OMD Canada and Studio M, filmed the touching spot called "The Recital." However, after the fatal Virgin flight last year, Virool decided to alter its award to something exponentially safer: the experience of a zero-gravity flight. Two days before takeoff, I got an email from Virool: Did I want to join? The flights are operated by Zero-G (more officially known as Zero Gravity Corporation), a privately held space entertainment and tourism company based in Arlington, Va. 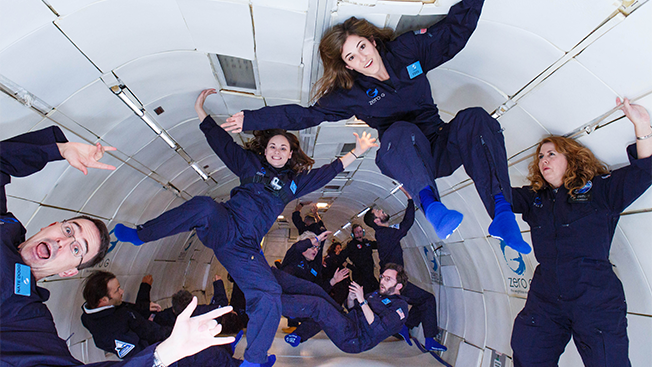 While Zero-G might fly under—or over—the radar, its passengers do not. Previous ones have included interstellar royalty like Buzz Aldrin, Stephen Hawking and Richard Branson. Even Martha Stewart. (Kate Upton also flew on Zero-G for her now infamous weightless bikini shoot for Sports Illustrated.) Oh, and it's also flown research flights for NASA. Zero Gravity Corporation operates between 70 and 80 flights a year, each with about 25 passengers, said president Terese Brewster. Around two-thirds of passengers come from the U.S., with the rest arriving from around the world. You have to be at least 8 years old to ride. The oldest so far was 93. And at about $5,000 per person, Brewster said it's the most affordable way to experience what it's like to be on the International Space Station—especially compared to the $15 million ticket that a few have paid to spend a week or two aboard the ISS via Zero-G's parent company, Space Adventures. So, how would Brewster describe zero gravity? "It is our biggest marketing challenge," she said. "We can tell everyone what it's not like. They say 'Oh, I've been skydiving.' No, it's not like that. Or, 'It's indoor skydiving.' Nope. Swimming, floating in the Dead Sea, all this stuff, and we say, no it's not. … It's almost dream-like in a sense, where you kind of feel this out-of-body experience." Brewster said it can also be "very zen-like"—if you don't try to do any tricks and just float. Zero-G is one of only a few ways in the world a person can experience reduced gravity outside of actually going to space. Flights throughout the year take off from airports around the U.S., but ours left from Fort Lauderdale, Fla. The plane itself is a modified Boeing 727. The front two-thirds of the seating area have been removed to make room for sitting, floating, standing, lying and flying that takes place during the two-hour flight. For takeoff, everyone is seated in regular seats until the plane is at cruising altitude. About five minutes later, an instructor tells everyone to lie on their back to prepare for a speedy ascent (at a g-force of of 1.8, for all you flight nerds). To create a reduced-gravity experience, the pilot steers the plane through a series of 15 parabolic arcs in the altitude range of a normal commercial flight. However, the comparisons end there, because for each arc, the pilot increases the flight angle up to a steep 45 degrees while rising from 24,000 feet to around 32,000 feet—all while pulling 1.8gs. After that, the plane begins a free fall at a similarly angled descent. In between the rise and fall, there are 20-30 seconds of the arc, where passengers experience one of three types of reduced gravity: one with Martian gravity (one-third my weight), two with lunar gravity (one-sixth my weight) and 12 with zero gravity. It's not easy to be graceful without gravity. It's also not easy to understand your own strength, because the slightest tilt of your toes might altogether ruin that scene from Apollo 13 that you've been waiting all your life to recreate. In fact, maybe you've been going about your entire life on Earth grounded with the expectation that you'll never be an astronaut. There is something beautiful about the confusion that mind and body endure when the laws of physics that it's known for decades suddenly don't match with the moment. But what else would anyone expect when it's tough to tell up from down? One second I was lying on my back with my hands by my side, pinned to the floor by an invisible force of extra g's. A moment late, I was levitating, carried away from the floor as my feet were effortlessly brought to the ceiling. Then, within a few seconds, I was uncontrollably floating to the back of the airplane, where the flight attendant pushed me back to where I came from before I accidentally kicked her in the face. Pro tip: If you're ever stranded in space, don't try to swim. It's a common mistake to make, given all the comparisons between weightlessness and water. However, take the H2 away from the O and you're left treading air. Going into space had been a longtime dream for Virool CEO Alex Debelov, who joined the crew of about a dozen for the journey. "When we were getting there, we were like, 'Alright, we're going to go in there, and I'm going to do this canonball, this crazy spider," Debelov said. "We had all these ideas—I was going to do an upside-down handstand with no hands. … But then what you quickly realize with this flight is that you are not in control and you quickly lose the notion of what is up and down and what's left and right." Debelov and I weren't the only two who felt confused by this 2016 space odyssey. "It would be this very slow-motion thing, doing slow rolls … and somehow in my head I thought you would be able to control what you were doing," said OMD Canada's Lindsay Hacker. "But the actuality of it is that every little thing that you do has huge impact, and you actually move around really chaotically and really fast. And you're just looking around seeing heads and feet flying around everywhere." Few were naturals, unless you were the guy seen soaring underneath other flying bodies catching pieces of candy everyone else missed. "I got all the incredible footage I'd hoped to get at the expense of my entire experience, 100 percent," Neistat told me after the flight. "I didn't see that coming. That might be the first time in my entire life I've said that. My head was in the camera because I've never seen anyone shoot it well. Ever. So I really figured out what I was going to do ahead of time, and I did it. But staring into a camera while floating was a really bad idea, and it affected me much more substantially than I had expected." Neistat said he focused not on experiencing what he was doing, but solely on what the device in his hand was actually recording. The fear of living offline, or FOLO, is powerful, indeed. "It was a lot more like looking through a telescope than being there in real life," he said. "It was very exciting because I got the shot but also very frustrating because I didn't get to soak in in as much. But my priority in life is always to get the shot." Just arrived back on Earth after floating around in zero gravity miles and miles above the Gulf of Mexico. So strange. So surreal. This video barely begins to capture the magic. Now all I want to do is be an astronaut. As a journalist, I know all about wanting to get the shot. (Or maybe more accurately, the quote.) But at what expense? I, too, tried recording some of those suspended memories. I also felt like I missed those moments. And while I got enough video for Instagram, I wish I wouldn't have bothered. Besides every photo I took is a blur. During this once-in-a-lifetime experience, each person wondered before and during the flight: Should I capture the moment or experience it? But the supercomputers in every jumpsuit pocket had a more powerful pull than the gravity below, as nearly every aspiring astronaut took it out for at least a fraction of those fleeting seconds. In the latest era of space travel, the authority of Newton's Law is less than Zuckerberg's code. There's another thing everyone wonders: Did I puke on the plane unaffectionately known as the "Vomit Comet"? I actually felt great. Only one person got sick. Don't ask who, because what happens in zero-gravity stays in zero-gravity. Besides, there's no proof, because nobody took video of that. So, how would I spend eight minutes without gravity if I ever get another chance? I'll spend it without my phone, which I'll leave behind on Earth. The night of the flight, as I was sitting in the regular airport waiting for my regular gravity-equipped airplane to bring me back to New York, I kept feeling the odd sensation that I'd felt hours earlier—every time we were about to float off the floor. It was like a "phantom ring" we've all grown accustomed to with our smartphones, where we think we're getting a call or a text or a notification.